Only the best will do for Aladdin Garage Doors. Our Branded Aladdin Series of openers are exquisitely engineered in Germany, so you know it’s fine craftsmanship and reliable. Here are the models we offer and what makes them superior to the rest. The AD360 is a feature-rich garage door operator system, built to last and guaranteed to provide years of smooth, trouble-free performance. 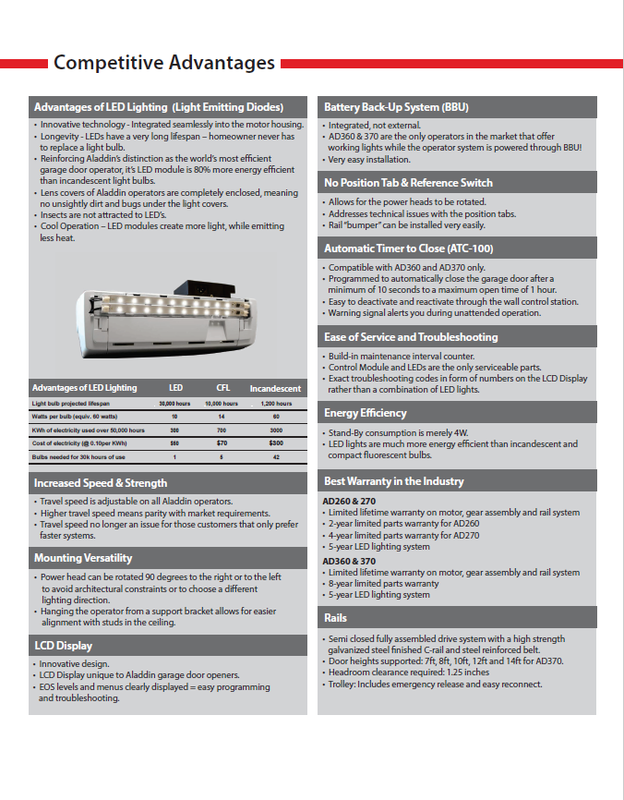 Innovative LED lighting and reduced stand-by consumption make the AD360 the most efficient residential garage door opener available, while the direct current (DC) Smart Motor , coupled with a belt drive system, ensures an amazingly quiet operation. The AD360 has capability for an optional integrated battery backup system, Energy Pack 100, that guarantees access in and out of your garage during power outages. Click to download pdf. 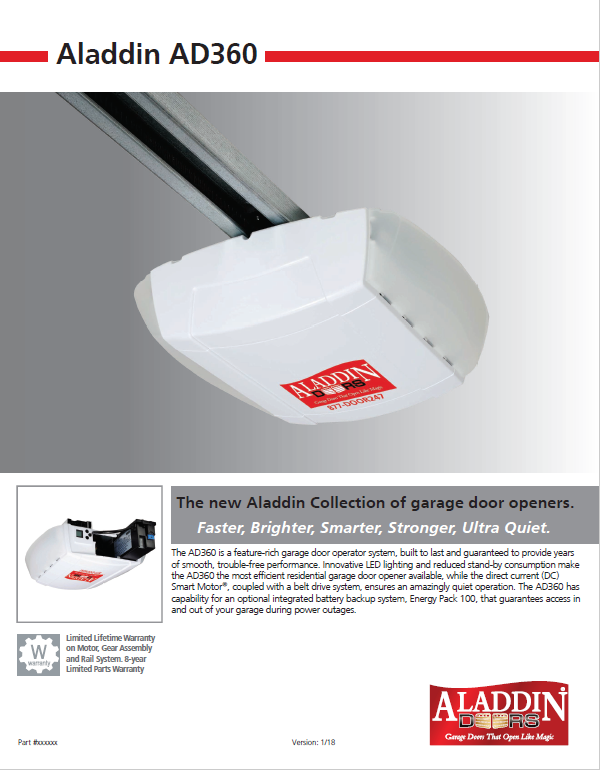 The AD370 is a feature-rich garage door operator system, built to last and guaranteed to provide years of smooth, trouble-free performance. 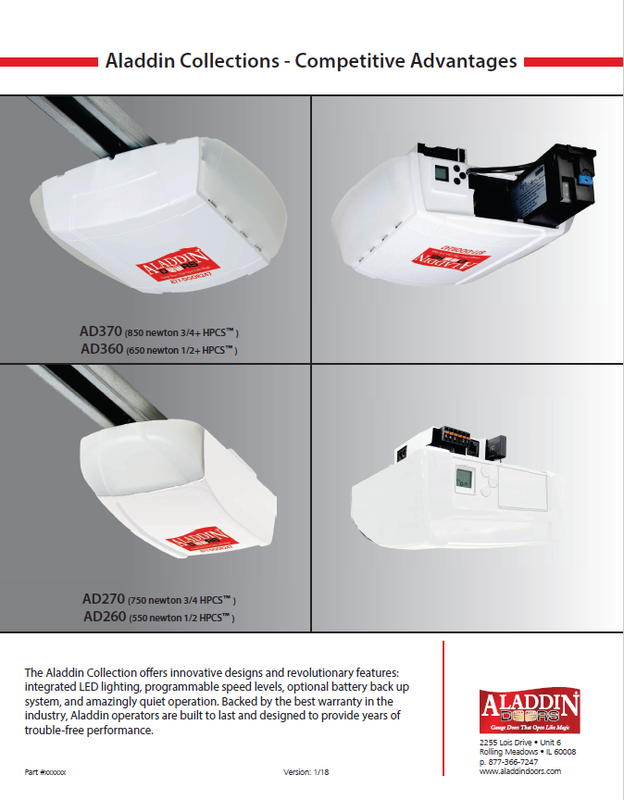 Innovative LED lighting and reduced stand-by consumption make the AD370 the most efficient residential garage door opener available, while the direct current (DC) Smart Motor, coupled with a belt drive system, ensures an amazingly quiet operation. The AD370 has capability for an optional integrated battery backup system, Energy Pack 100, that guarantees access in and out of your garage during power outages. Programmable travel speeds of up to 9.3 inches per second make the AD370 one of the fastest garage door operators available. Click to download pdf. 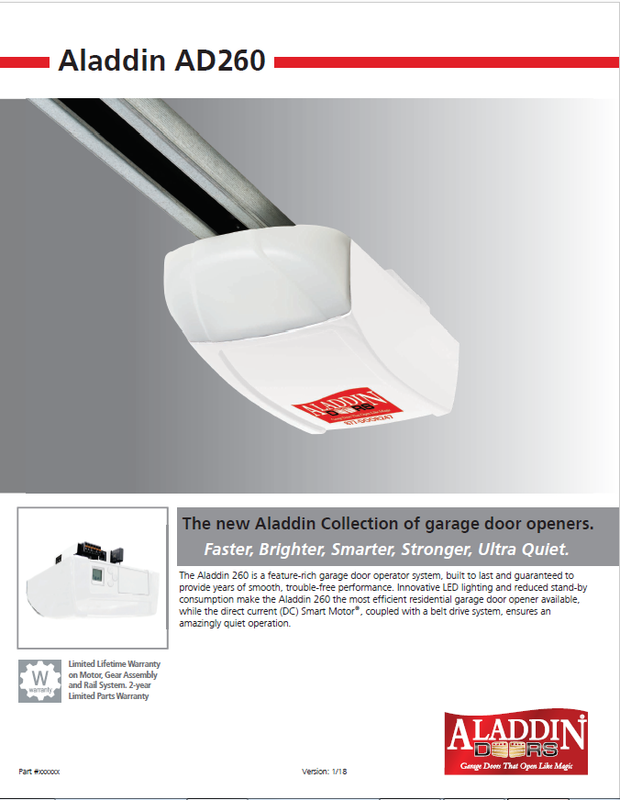 The Aladdin 260 is a feature-rich garage door operator system, built to last and guaranteed to provide years of smooth, trouble-free performance. 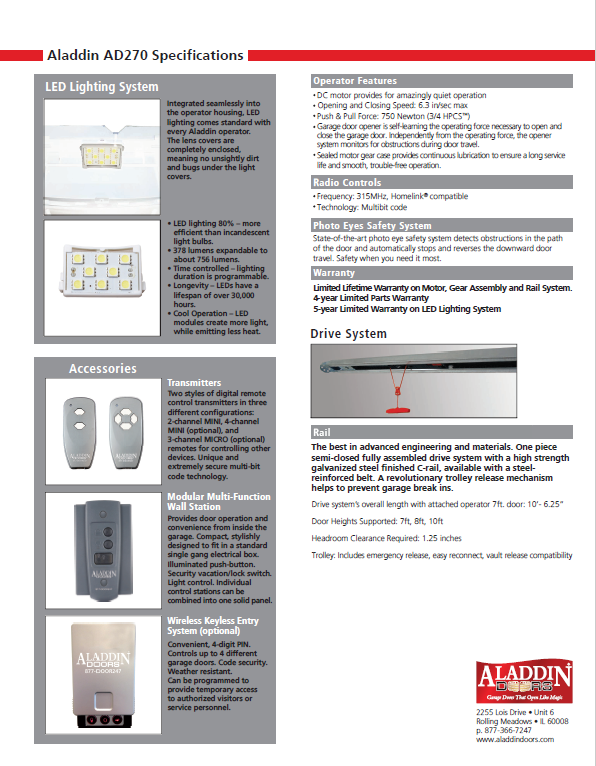 Innovative LED lighting and reduced stand-by consumption make the Aladdin 260 the most efficient residential garage door opener available, while the direct current (DC) Smart Motor , coupled with a belt drive system, ensures an amazingly quiet operation. Click to download pdf. 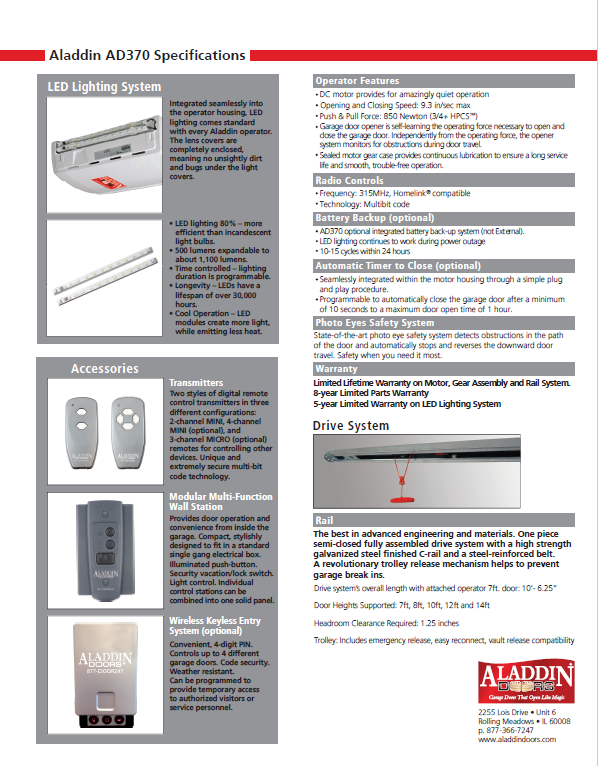 The Aladdin 270 is a feature-rich garage door operator system, built to last and guaranteed to provide years of smooth, trouble-free performance. Innovative LED lighting and reduced stand-by consumption make the Aladdin 270 the most efficient residential garage door opener available, while the direct current (DC) Smart Motor, coupled with a belt drive system, ensures an amazingly quiet operation. Click to download pdf. 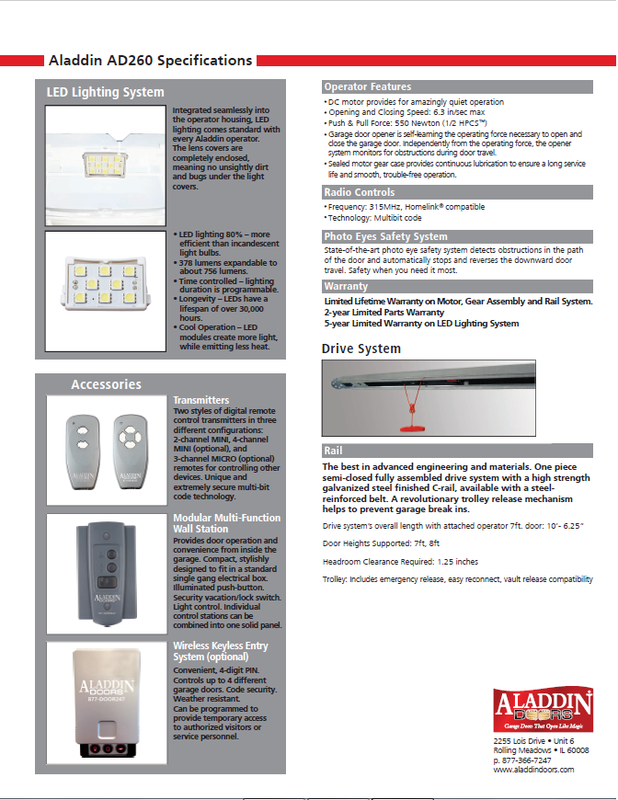 The Aladdin Collection offers innovative designs and revolutionary features: integrated LED lighting, programmable speed levels, optional battery back up system, and amazingly quiet operation. Backed by the best warranty in the industry, Aladdin operators are built to last and designed to provide years of trouble-free performance. Click to download pdf. "Came earlier than appointment time but called first to make sure it was ok. Very friendly"